Embed Google custom search into website or blog and enable your website visitors to search your website. Google custom search is a powerful Google feature that webmasters can embed into their website or blog. Embed Google custom search into website and save the hassle of developing a in house search engine for your website. Embed Google custom search into website or blog and leverage Google’s powerful search technology to power search on your website. 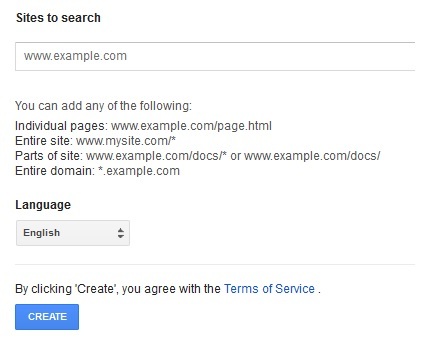 If you want to embed Google Custom Search into Website or blog, follow the simple steps outlined below. 2. Click Add to create new Embed Google Custom Search. 3. Create a name for the Google Custom Search engine you are adding. Also type in the URLs you want to include in this Google Custom Search. Typically this is the Website name and Home Page of the website. We have used SimplyLikeIt as an example. Click Create. 4. That is it. Click on Get Code to grab the code that you embed Google Custom Search into website or blog. This simple process will enable users to search your website directly from the page you insert this code. For a sample preview of Google Custom search, see below for a live demo. 5. For Advanced configuration options, in the Sidebar, Google Custom Search will provide you with numerous options to enhance the look and feel of the search bar. The Setup option in the sidebar will enable you to configure the Adsense settings in the Make money tab, change the indexing rate in Indexing, and include Google Image Search in Basics. Google custom search is a great tool all webmasters should use as it uses Google’s powerful search technology to enable your website visitor to search y website. If you constantly update your website with refreshing content, you might have to update your search index with this content to make it searchable to your website visitor. However, using Google custom search, you can simply embed Google custom search into your website and leverage the index Google has already created for your website and present it to users instead of writing a search program of your own. Google custom search provides many great customization features like the ability to add image search to your website by using Google image search. If you are a Google Adsense publisher, you can easily embed Google custom search and link it to your Adsense account to make money when people search using Google custom search and click on the the ads Google displays next to the Google search result. This is a great incentive for webmaster to leverage Google custom search as they can easily embed Google custom search into website and make money using the search result ads Google Adsense displays. Once you create the embed Google custom search code, you can easily integrate it on to the search page by cutting and pasting the embed Google custom search code. Embed Google custom search into website or blog and use Google’s powerful search technology to power search result for your website visitor.